Brown bagging lunch? 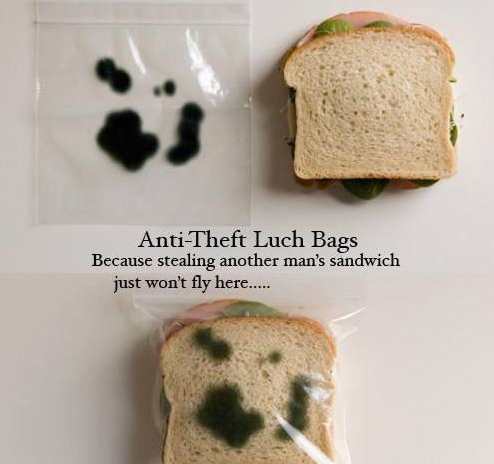 Tired of having your sandwiches stolen? I want version B with small fuzzy-looking blue-green patterns. Somebody does not know how to spell correctly. His food was not touched after that. I’m a true believer in karma. You get what you give, whether it’s bad or good. No, now they’ll throw it in the trash for you instead. These came out a few years ago. Clever. Last time I brown-bagged it was when I was an intern in NYC. I seldom got the chance to eat it and it would grow it’s own tribbles. Then the hospital changed it’s policy and decided we 48 hour slaves could eat for free in the cafeteria. The fuzzy sandwiches might have been a better choice. 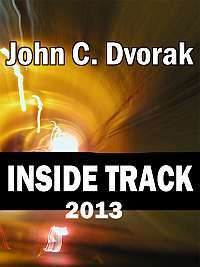 Noon conferences for hot spots. Try to get there early because when the hairnet lady delivered the food, they always had the leftover morning donuts and sweetrolls. But there were never enough. If you missed out, you’d have to settle for a peanut butter and jelly sandwich. If you waited to show until time, you’d be stuck with bologna sandwiches (on buttered bread!) with a wilted leaf of lettuce..or, maybe, that was just a slice of tribble. I would never steal another man’s lunch. Not after learning about ex-lax cookies and sandwiches made with diaper scrapings. Bad Behavior has blocked 13718 access attempts in the last 7 days.